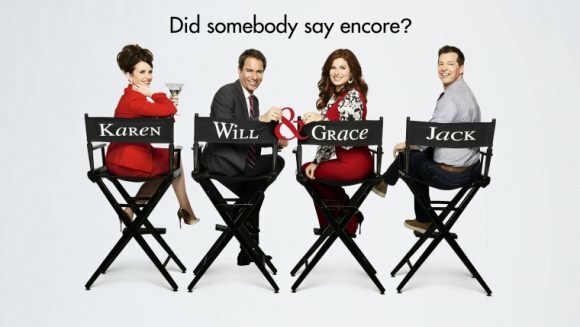 TVNZ 2 will premiere the Will & Grace revival on October 2. It will air 8.30 Mondays after My Kitchen Rules NZ, which starts on September 25. As a curtain-raiser to season nine of Will & Grace, the first in 12 years, TVNZ 2 will re-run the first episode of the original series after the return of MKRNZ, at 9.05. “Despite updating for the modern era with a few jokes and a refurbished kitchen, Will & Grace still feels comfortably the same — and that’s good,” reckons Slash Film. Will & Grace first resurfaced last September in a surprise mini-episode on YouTube when the gang reunited to discuss the US election, The Guardian recalls in an article about a pending season of comedy revivals that includes Roseanne and Curb Your Enthusiasm. The season nine episodes will air here within four days of Will & Grace’s US broadcast (where NBC also is mulling over resurrecting The West Wing, The Office, 30 Rock and ER). Will & Grace’s fast-track scheduling will be similar to The Big Bang Theory’s and coincides with Three picking up the right to Modern Family and screening it much closer to the US. Season nine of Modern Family starts later this month on Fox and is likely to debut here mid-October, on a double-bill with a new Hamish & Andy replacement for Jono and Ben. According to the blurb, True Story With Hamish & Andy has the duo sitting down with “everyday Aussies who recount their hilarious true stories” — which they try to recreate using popular TV personalities. The Daily Telegraph reports a second series has been ordered after the first five episodes “were a huge hit with the launch averaging more than 1.4 million viewers”. Will and Grace needs bigger newer fresher line up with no rubbishy repeats or reality — we need blockbuster entertainment series 5 nights a week. Shortland Street will win over the night with newer series of shows, so dump Neighbours and Big Bang for good quaility entertainment that help the NZ soap.